Wood on Words: 54- Hitting the USA Today Bestseller List! 54- Hitting the USA Today Bestseller List! 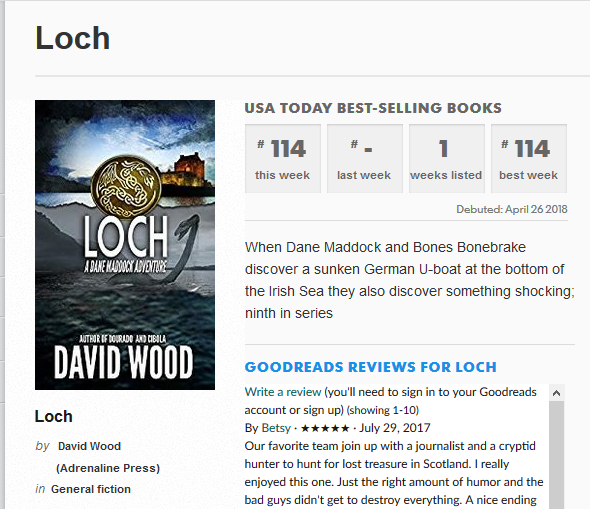 LOCH, came in at #114 for the week ending 4/22. (Good thing they don't cut it off at 100, huh?) When my friend Joanna Penn hit the USAT list, she did a helpful writeup of the strategies she used to get there so I thought I'd do the same. I started by lining up a Bookbub ad. I was fortunate to get one on a Wednesday, early enough in the week to have the long tail sales count toward the USAT list, but not so early as to be overwhelmed by the Big 5 new releases that come out on Tuesdays. USA Today's rankings cover a Monday-Sunday period, so my promo efforts ran throughout the week, beginning on Monday 4/16. In order to be considered for the USAT list, a book must have at least 500 US sales with a store other than Amazon, so I targeted iBooks with one dedicated ad and one tweet. The book I promoted was discounted (from $3.99) to $0.99. I had never done a promo on this particular title, so it was the first time that subscribers to the various lists were seeing it on sale. I didn't really expect to hit the list. My intent was simply to stack a few promos and have a nice week of sales. I threw in the iBooks-specific ad simply because it's a good practice. Once I saw how well my Bookbub promo performed, I knew I had a chance. I could have done more/better things had I planned ahead and believed I had a chance. Lowered the price to 99 cents on all ebook platforms. I really should have done this on Saturday since certain distributors (*cough* Nook *cough) can be slow about updating prices, but I had a brain cramp. Emailed a segment of my mailing list.